Automobile accidents are devastating and painful experiences, and if you’ve ever been in a car crash, you know how traumatic it can be, even if no one was seriously injured. 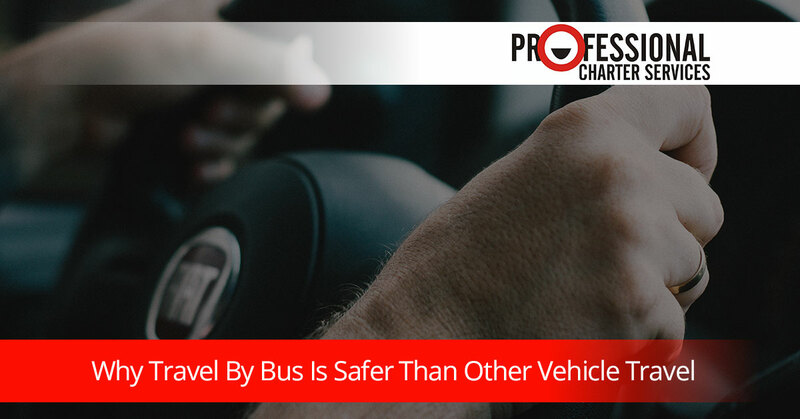 In this article from our charter bus rental company in San Francisco, we’d like to cover some of the reasons why it is safer to travel by bus than to drive your own car. There are almost 40,000 fatalities due to motor vehicle accidents each year in the United States and far more accidents with injuries where no one is killed. If you have an event where multiple people are driving to the same destination, one of the safest options you can choose is to have everyone ride together in a rented charter bus. 1. Bus companies hire trained, experienced drivers. The driver of a vehicle has to make many judgment calls on a moment-by-moment basis, and the less experience a driver has, the more likely they are to have a crash. It’s well known that younger drivers (age 16-20) are statistically much more likely to have a car accident. Bus companies like Professional Charter Services pride themselves on hiring drivers who are experienced, making sure they have the proper training, and offering their customers a ride that feels safe, smooth, and secure. These drivers think ahead and thereby avoid many of the obstacles that could get the vehicle in trouble. They look down the road and prepare for what they see ahead of them so that they have time to react. 2. Bus drivers know they have to be more cautious. Part of the moment-by-moment knowledge that every bus driver has to keep in mind is that they’re driving a huge, lumbering vehicle that weighs thousands of pounds. It takes forever to accelerate. It takes longer to slow down if they hit the brakes hard. It is definitely not zippy or nimble like a little sports car that can get out of a bad situation by stepping on the gas, making a quick sharp turn, or stopping suddenly. Bus drivers know that they have to drive in a way that matches the capabilities of their bus, and this requires them to be more cautious, courteous, and watchful on the road. 3. Bus drivers know they are carrying precious cargo: people. The ability to transport passengers safely from point A to point B is a thing that bus drivers take very seriously. It’s one thing to avoid property damage with a large vehicle; it’s a completely different thing to avoid hurting people. The passengers on the bus are mothers, fathers, sons, daughters, husbands, wives, friends, and companions to someone, and if anything happens to them, the grief and loss is incalculable. No bus driver wants their job to be burdened with the nightmare of the memory that one or more of their passengers got injured or died while they were driving. 4. Bus passengers are less likely to be seriously hurt in an accident. Think about the size of a bus. If a cargo van rear-ends you in your little compact car, it’s going to hurt, but if that cargo van rear-ends a bus, it’s possible that no one on the bus would even have whiplash. When you’re riding in a bus, you’re riding in a big, heavy vehicle that is built to protect you, keep you in your seat, and buffer the severity of the accident. In 2013, there were 32,675 people who died in motor vehicle accidents, but only 48 (or 0.1%) of these fatalities were from bus occupants. Professional Charter Services is proud to offer you safe, reliable drivers every time you rent a charter bus from our company. Get your free quote today.